Depending on where you sit, this movie’s a draw for very different reasons. From the mainstream perspective, two words: Kristen Stewart. The young actor, who catapulted to worldwide fame in the “Twilight” series, has, like her co-star Robert Pattinson, been using the clout that such stardom brings to effectively branch out as a performer. In the contemporary movie business, the transaction works both ways: big young star stretches creative muscles by signing on to challenging, filmmaker-driven projects; challenging, filmmaker-driven projects get their financing because a young star who wants to stretch his or her creative muscles has signed on to it. In cases like those of Pattinson’s and Stewart’s, the stakes, and the intrigue, get raised, because both performers have wildly enthusiastic (not to say rabid) fan bases that seem willing to follow their idols anywhere. Which is not to say that movies like “Maps To The Stars” (Pattinson working for the second time with maestro of unsettling content David Cronenberg) or this Stewart co-starrer are fated to rack up “Twilight”-comparable numbers. But they will be seen by a segment of the mass audience that in most other circumstances isn’t interested in auteurs. The Stewart-intrigue factor is in itself a double-edged sword, because for every 10,000 growing teens for whom Stewart can do no wrong, there’s one film critic, amateur or professional, who still is not sure if Stewart “can act.” (I am not one of these; I was impressed by her in “Panic Room,” “Undertow,” and “Into The Wild,” to name three of her pre-“Twilight” films.) They look to films such as this one, and another recent Stewart indie, “Camp X-Ray,” to settle the question for them once and for all. Then there are those for whom this movie’s a draw because of its writer/director, Olivier Assayas, working here not just with Stewart but with the great French actress Juliette Binoche, who was also in Assayas’ terrific 2008 family drama “Summer Hours.” Assayas is one of world cinema’s most penetrating and unpredictable talents; for instance, the two films he made prior to this one were “Something In The Air,” an affecting, autobiographical coming-of-age story of politics and cinema in the early ‘70s, and before that, the sweeping, bracing, not-at-all-sweet “Carlos,” a trenchant biopic of the titular real-life terrorism perpetrator whose activities galvanized Europe for a period. “Clouds of Sils Maria” is entirely different in some ways from those two films, but its invented worlds are very much in keeping with Assayas’ concerns about how art and reality intertwine and feed off of each other. The setup for the picture seems to promise a story of rivalry among artists: the movie begins on a train; world-renowned actress Maria (Binoche) is on her way to visit her artistic mentor Wilhelm Melchior, and deliver a speech at a ceremony honoring the reclusive theater master. Maria has her efficient but frazzled and very hip young American assistant Val (Stewart) in tow; Val’s the one in charge of the schedules, the multiple smartphones, and the texting, and it’s Val who first learns that Melchior, the man they’re on their way to see, has died. This loss changes the dynamic of the event. Maria has barely time to register her loss than she’s regaled with Chanel in a theater corridor; whisked through a photo shoot; reintroduced to a former co-star she never liked; and approached by a hot young theater director to appear in a revival of the Melchior play that made her famous. Playing, and this is no small thing, not the ingénue role that she is now to old for, but the role of an older, more embittered character. Set to play the younger woman’s role is of course a younger woman, a scandal-riddled star played by Chloe Grace Moretz and initially seen mainly via paparazzi videos Val finds for Maria on YouTube. After this flurry of activity Val and Maria repair to Melchior’s house in the title village. It’s not far from this place that a particular cloud formation called the Maloja Snake, which provides the Melchior play with its own title, occurs. Aside from feeding each other lines from Melchior’s play, and arguing about life and art and career, Maria and Val aspire to go on a hike and witness the snake-like cloud formation as it appears. In the meanwhile, elsewhere in Europe, Jo-Ann (Moretz) and her latest male conquest, a boy toy with literary pedigree, hone in on, you might have guessed it, an opportunity to stretch creative muscles and/or gain some form of artistic cred; for whatever reason, Jo-Ann is hungry for a form of respectability even if she can’t quite fathom what kind, not to even mention why. In précis form this material looks like an unlikely walk into “All About Eve” territory for Assayas, only with more self-reflexivity. 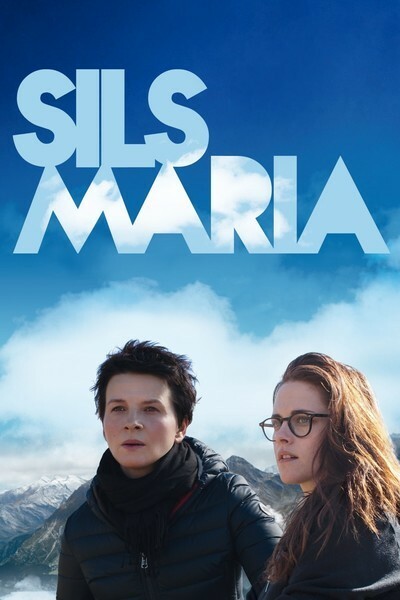 But in spite of the superficial dynamics of the young-actress-meets/conquers-older-star scenario, which are fully acknowledged, “Clouds of Sils Maria” is oodles more poetic and enigmatic than the term “backstage drama” generally encompasses. It isn’t a story of predatory ambition or women stabbing each other in the back; all the characters in the movie have their reasons, but the film, at least in the show business aspects of its story, is concerned with the paradox of self-preservation within an enterprise that requires you have to invest your trust with so many other people. Artistic creation begins in the first person singular, but then turns plural, and not everyone who gets on board makes it all the way to the end of the trip. To that end, Assayas executes a gambit in the final fifth of the movie that makes matters all the more enigmatic. It’s almost as if the conflicts the film depicts up until this point—rendered in convincing, epigrammatic dialogue and action, performed with sometimes searing conviction by Binoche and Stewart in particular—have suddenly been deemed too pat by the filmmaker. His way of shaking thing up is…intriguing, for sure. It's one of those moves that make a second viewing worth contemplating. In any event, the pleasures of the acting and the ever-acute visuals are apt to make a second viewing a distinct pleasure, even if it doesn’t solve anything.